Discover the Tour du Mont Blanc with this guided hike. A 5- or 7-day guided trek to discover the most beautiful glaciers and peaks in the Alps! Faithful to its myth, the Mont Blanc is an unmissable massif of the Alps. During this trek, which will take you from France to Italy, then to Switzerland, you will admire Mont Blanc from all angles, under all its lights! To go around, is to discover an incomparable universe, that of the high mountain, impressive and magical, and the spectacle of the nearby glaciers descending from peaks to the mountain pastures. From Courmayeur to the Chamonix valley, from the Arpette window to the wild Val Ferret, along the Swiss, Italian and French slopes, the paths venture between pastures, glaciers and peaks, crossing passes and valleys. A chance meeting with some marmots players, a fearful chamois or an ibex with golden eyes is still possible. A domain of untamed nature, the massif is also the territory of the women and men who live here. Going around Mont Blanc is also discover through villages and hamlets, a familiar and warm mountain, full of tradition. 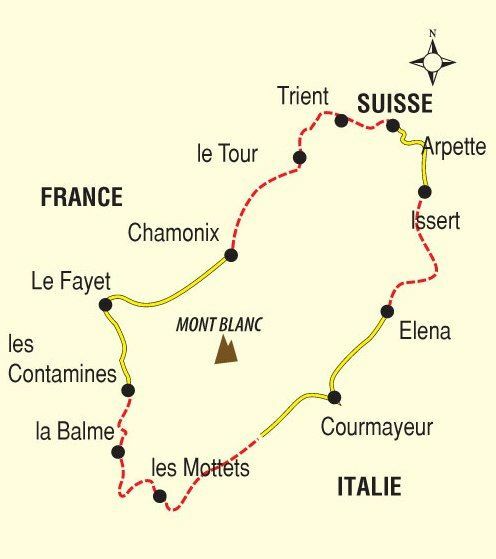 Gather 10:30 at Montroc-le-Planet train station, ascend the balcony of the Posettes, until the Col de Balme (2200 m), Franco-Swiss border. View of the nearby glaciers of Argentière, Le Tour and the north of the Mont-Blanc massif. Descend in the Swiss pastures to the village of Trient. Descend to the village of Champex and bus transfer to the village of Fouly. Ascend to Col Ferret (2537 m), border with Italy. Possible meeting with alpine farmers of the alp of the Peule. Descend into the Italian Val Ferret, under the impressive foothills of the back of Mont Blanc. Continue to Pré de Bar glacier where you will overnight in refuge facing the glacier. Ascend to the Bonatti refuge and cross on the balcony of the Saxon mountain, offering an unusual view of Mont Blanc, Mont Dolent, Needle Triolet, Grandes Jorasses … Descend to Courmayeur with short transfer to reach our cottage on the heights of Courmayeur. Trek to the glacial lake Miage and Seigne, Franco-Italian border. Detour possible by the large south balcony of Mont Blanc through the Chécroui pass and Mont Fortin, revealing unreal Himalayan profiles. Trek to Beaufortain and ascend in the mountain pastures between torrents and waterfalls to Col des Fours (2714 m), the highest point of the hike. Descend to via the Col du Bonhomme (2300 m) toNotre Dame de la Gorge, which was once great passage of peddlers. Continue by the old Roman road at the valley bottom and a short transfer to reach our night in Contamines Montjoies. Ascend to Bioassay Glacier through the village of Champel or the Tricot Pass (2120 m). Enjoy the views of the Chamonix Valley, the domes of Miage and Mont Blanc nearby. Descend to the village of Les Houches. We may have to modify the indicated itinerary: either at the level of the organization (problem of overload of the accommodations, duplication of the groups, modification of the state of the ground, landslides, degraded trails, etc. ), or directly because of the guide (weather, group level, etc.). These modifications are always made in your interest, for your safety and for a better comfort! Meet Saturday at 09:30 at Chamonix SNCF train station. Welcome and collect your picnic lunch. Leave Chamonix and ascend by cable car to Planpraz. Hike to Lake Cornu through the massif of Aiguilles Rouges, or crossing in balcony to the refuge Flégère. The path joins the lakes of Chéserys and continues always in balcony at the foot of Aiguilles Rouges, then down to Col des Montets. Enjoy unobstructed view of the entire Mont Blanc massif for this first day. Ascent by the balcony of the Posettes until the Col de Balme (2200 m) – border of France and Switzerland. View of the nearby glaciers of Argentière, the Tour and the Mont Blanc massif. Descent in the Swiss alpine pastures to the village of Trient in Switzerland. Depending on the conditions and the form of the group, cross the alpine pastures of Bovine by a path in balcony overlooking the Rhone valley or mounted along the Glacier of Trient, to reach the mythical window of Arpette, through the high mountain pass at 2700 m.
Cross the Val Ferret in Switzerland, dotted with small typical villages. Each village has its own undeniable charm with its traditional chalets and barns. Possible visit of a mill dating from the 16th century. Along the walk, the spectacle of the glaciers – Saleina and A Neuve can always be viewed. The discovery of the Val Ferret continues until the Grand Col Ferret (2537m), going up the pastures of La Léchère to La Peul through the herds of magnificent little black cows – the cows of Hérens. Descend into the Italian Val Ferret, at the foot of the Pré de Bar glacier and Mont Dolent, meeting point between France, Switzerland and Italy. Possible small bus transfer to reach the cottage. Ascent to the alpine chalet of Arminaz for an exceptional balcony crossing along the Mont de La Saxe, offering an unusual view of Mont Blanc, the Aiguille du Triolet and the Grandes Jorasses. Possible to cross by the Sapin Pass and the ridge of Mount Saxony. Descend to Courmayeur and transfer by bus to reach the refuge on the heights of Courmayeur (10-15 minutes). Climb the glacier lake Miage then to the Seigne Pass – Franco-Italian border. Detour possible by the large south balcony of Mont Blanc through the Col de Chécroui and Mont Fortin, revealing the unreal Himalayan profile of the southern face of the Mont Blanc. Continue the trail to the valley of Beaufortain, ascend in pastures, between torrents and waterfalls up to Col des Fours (2714 m), the highest point of the hike. Descend to Notre Dame de la Gorge via the Col du Bonhomme (2300 m), then to the bottom of the valley by the old Roman road. Short transfer to reach the village of Contamines-Montjoie. Ascend to the glacier Bionnassay by the village of Champel or the Tricot Pass (2100 m) and be charmed on the views of the Chamonix Valley, the domes of Miage and Mont Blanc nearby. Descend to the village of Les Houches. End of the hike on Sunday at 16:00 at the foot of the gondola Prarion aux Houches. We may sometimes have to modify the indicated itinerary somewhat: either at the level of the organization (problem of overload of accommodation, duplication of groups, modification of the state of the ground, landslides, degraded trails, etc. ), or directly by the guide (weather, group level …). Trust us, these changes are always made in your interest, for your safety and for a better comfort! Price is subject to changes without prior notice. Form your private group is possible from 6 people. Price may differ. Please contact us to get a quote. For good walker. 5 to 7 hours of walking a day, +/- 900 m of altitude difference on average per day. Accessible to children who are good walkers and motivated from the age of 12 (with their parents). Being able to easily walk 12 km (in plain) in 2 hours maximum. If this is not the case, within three weeks before departure we advise you to undertake a little training (2 to 3 times a week): 4 to 5 km of jogging or 2 to 3 hours hiking or biking. Your physical preparation will facilitate your stay and allow you to appreciate it even more. You only carry a backpack for the day with the necessary for your hike and the picnic lunch. Your luggage will be transferred by vehicle. 9 days program: 8 nights in dormitory or multiple room, Refuge, lodging or hotel. All accommodations are equipped with hot showers. 9 days program: 6 nights in a shelter, lodging or hotel in a room for 2 persons, 1 night in a dormitory for 6 persons, 1 night in a 4-person dormitory refuge. Breakfast and dinner are served in the accommodation. Your guide will prepare the picnic lunch which usually consists of various salads and regional products. Please tell us when you register on any food allergy or special diet; we will do our best to adapt your meals. A local certified mountain guide. 9 Days Program (Saturday) ~ 0930hrs at Chamonix train station. You will receive about two weeks before your departure, a confirmation notice specifying the time and place of the appointment, the name and contact information of the guide and the address of the first accommodation. You can extend your trip before or after the trek to Les Houches or Chamonix on request. If you book a hotel night in the Chamonix Valley, you can ask your hotelier for a guest card, offering free public transport in the Chamonix Valley. At your convenience, from 15 June to 15 September. Go out with friends or family at the dates that suit you. Customisation possible from 6 people. When you book the tour please give us one or two other departure dates in case your 1st choice is not possible. Price may differ from the above cost. Return by Les Houches railway station. Geneva Airport (GVA) is the closest one. – From Les Houches, Chamonix to Geneva airport direct ; about 19€ 1- way ; with reservation ; duration 2 hrs. A comfortable backpack of 30 to 40 liters for your day’s necessities (warm clothing, a raincoat, water-bottle, box and cutlery for picnics, sunscreen and identity papers) and a little room for picnics and snacks.